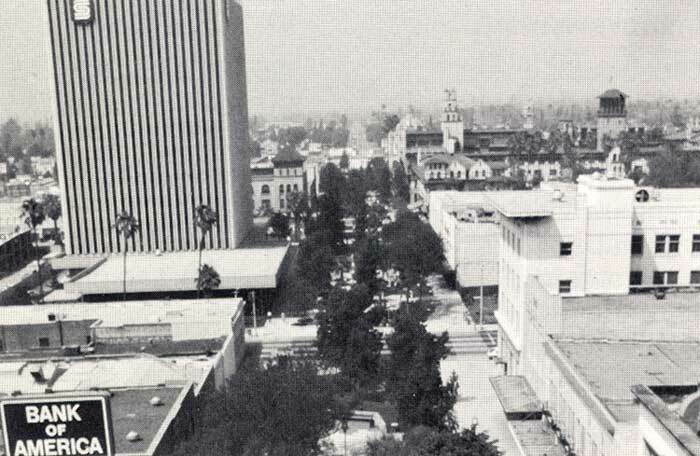 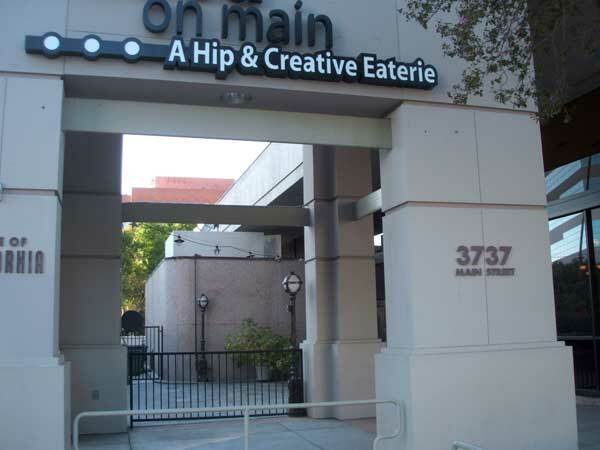 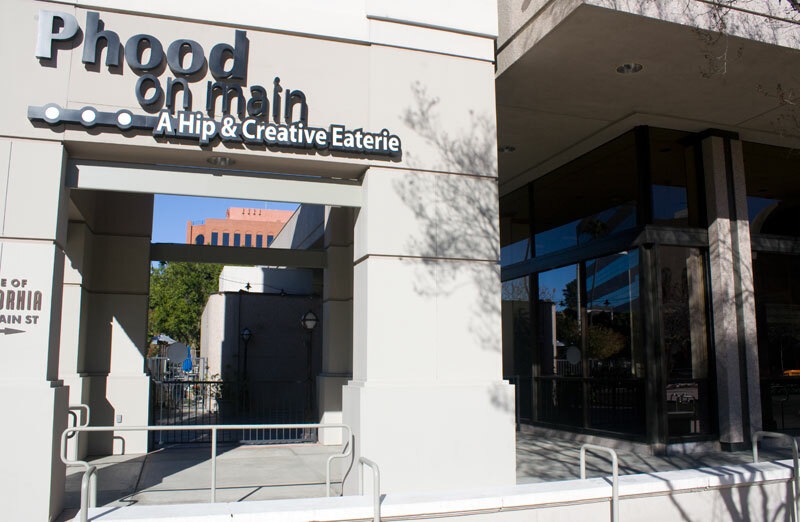 Just over 40 years ago, in April 1973, the first of three modern, mid-rise office buildings opened along Riverside’s downtown pedestrian mall, ushering in a new era of mixed uses and densities along Main Street. 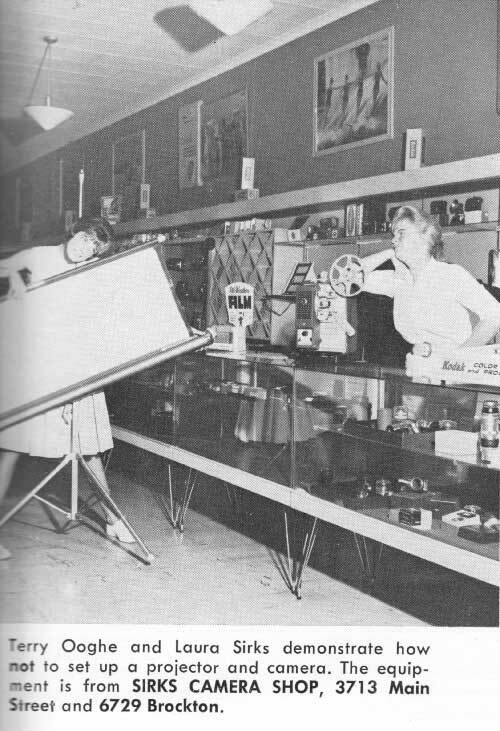 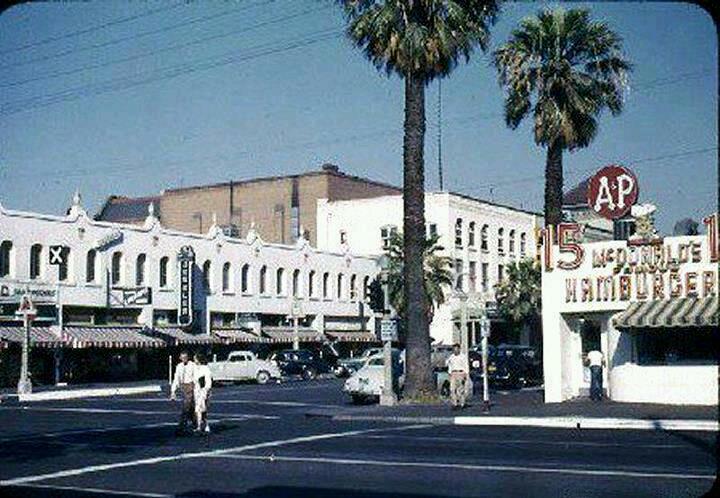 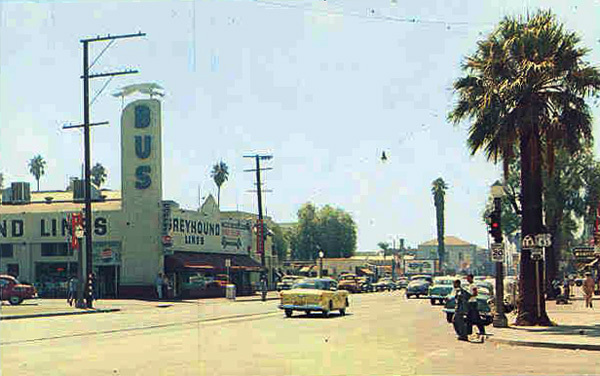 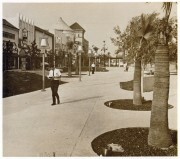 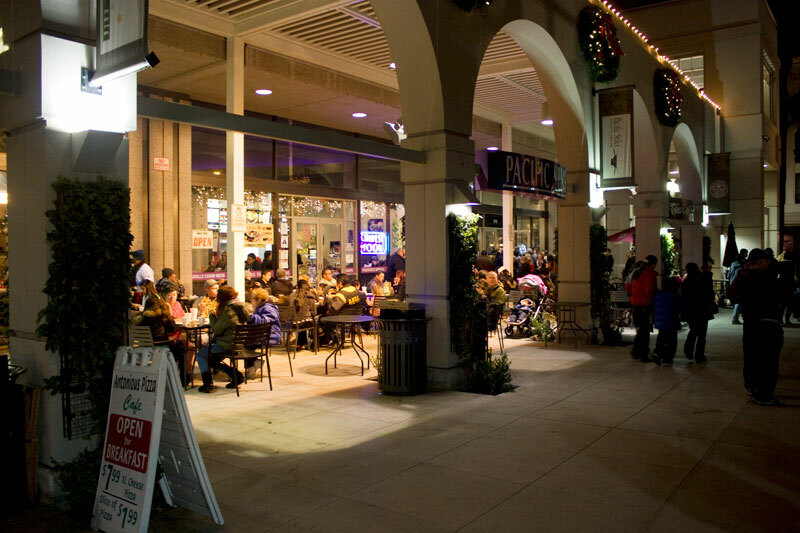 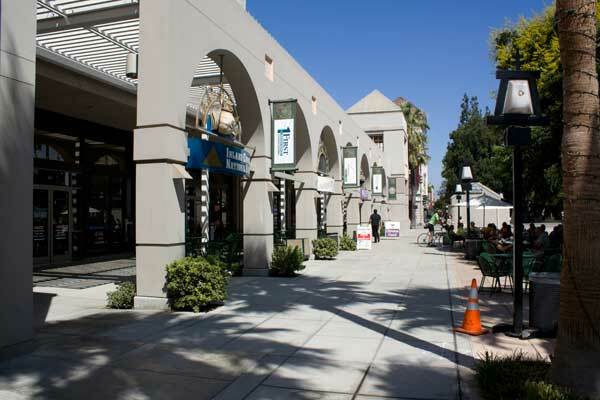 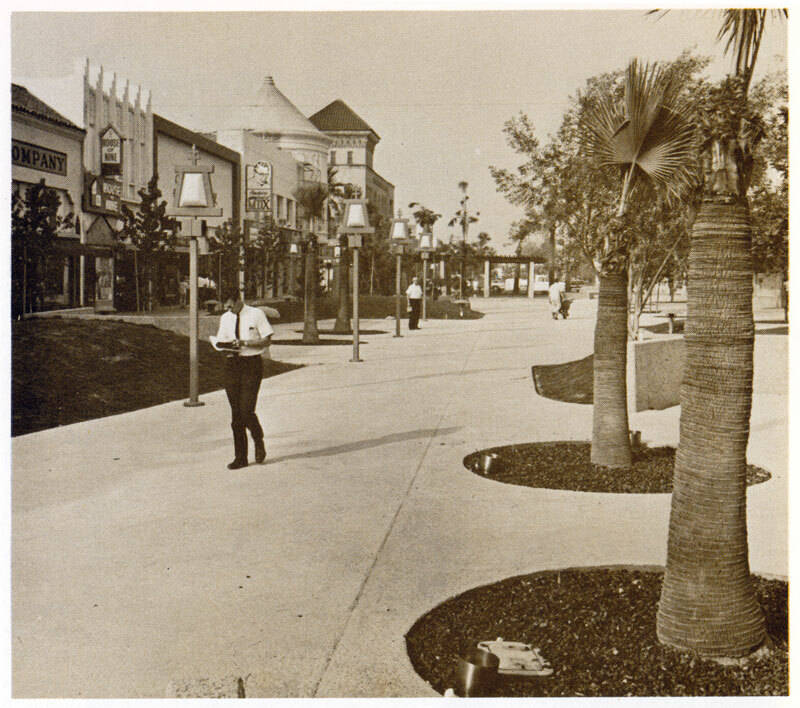 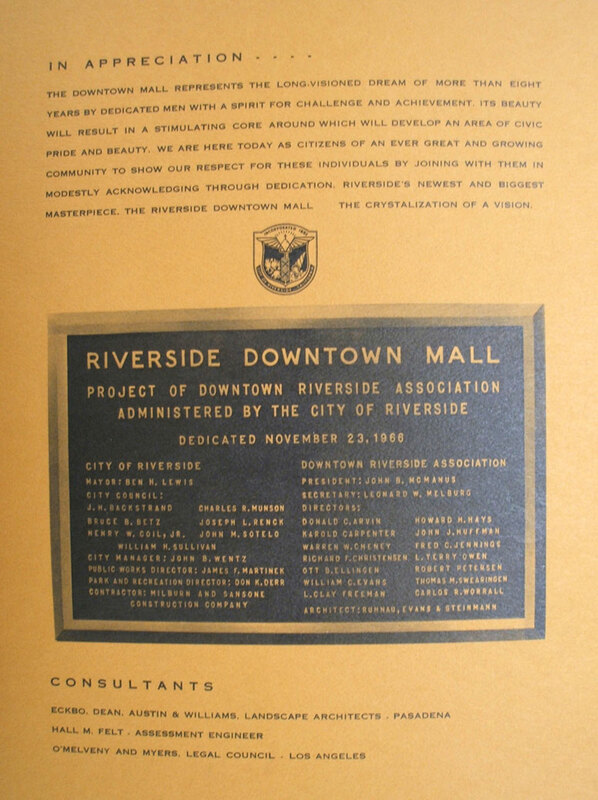 Like many American downtowns of the era, downtown Riverside’s retail component continued declining during the 1960s, due in part to the rise of the suburban mall and resultant changing shopping habits, a phenomenon that took root locally following the June 1956 opening of the first phase at Riverside Plaza. 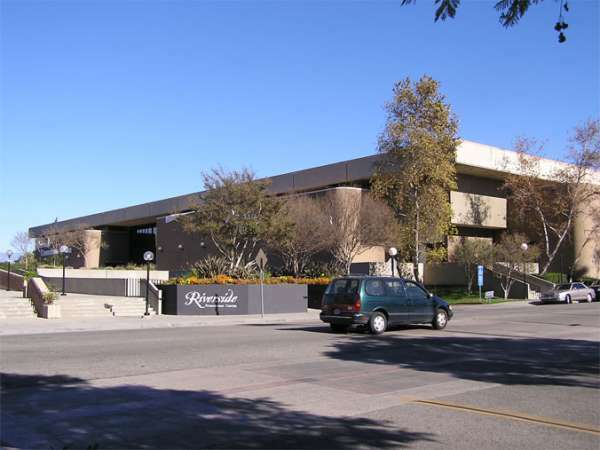 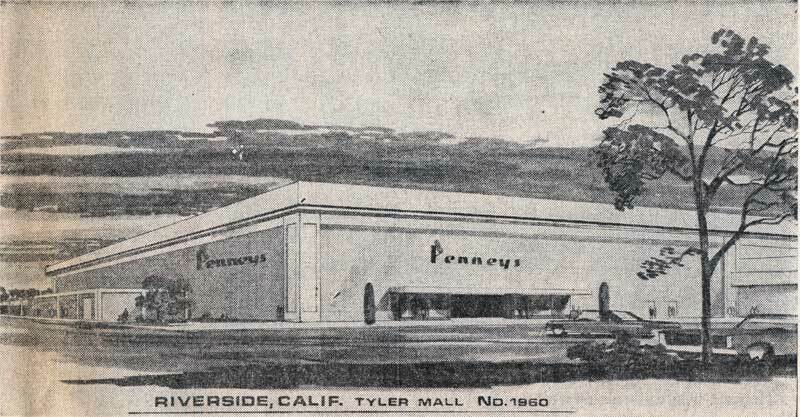 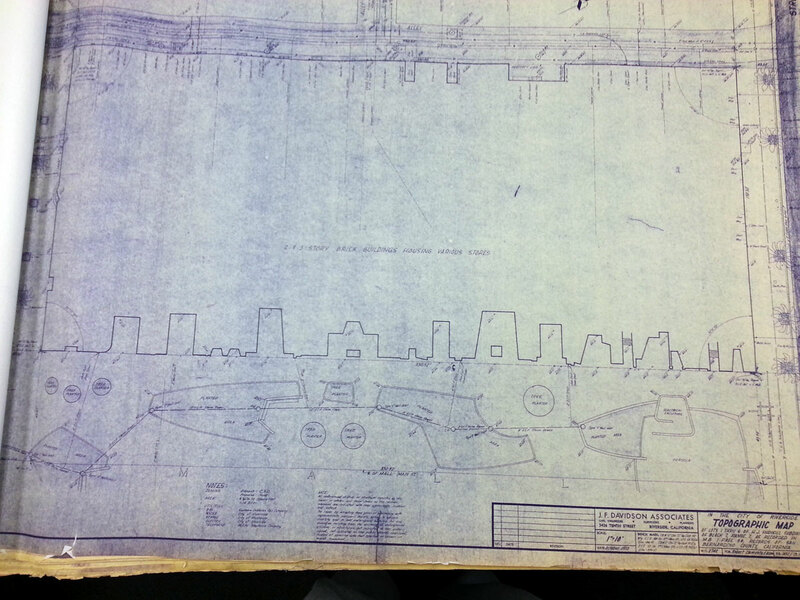 In the wake of the continuing exodus of retailers, heightened by the 1970 opening of Riverside’s second mall (Tyler Mall — now Galleria at Tyler), plans refocused on increasing density and mixed uses along the pedestrian mall, including a new 7-story city hall (1975) and large exhibition hall (1976) anchoring opposite ends of the mall. 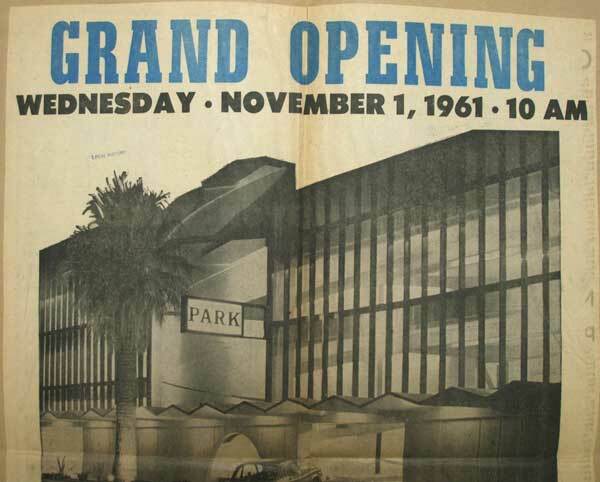 The first of these projects to be completed, however, was Security Pacific Plaza. 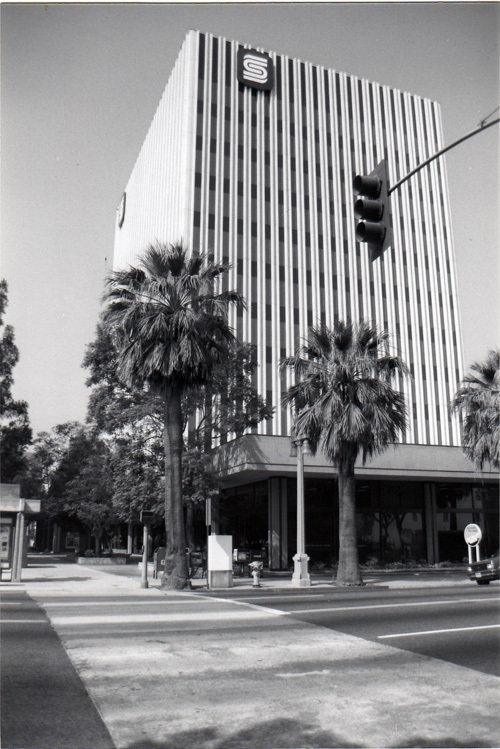 Located on the 3701 block of Main Street, the project was announced in December 1970 and completed in April 1973 (with an adjacent parking garage in 1975). 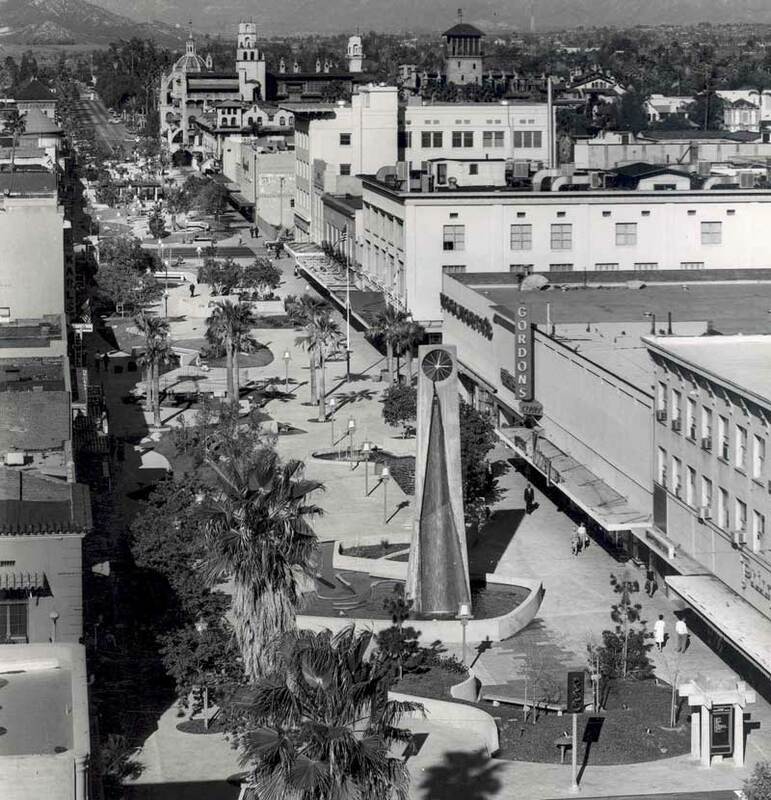 The development removed an entire city block of older buildings, including the iconic Hayt Building as well as Riverside’s first brick building (the B.D. 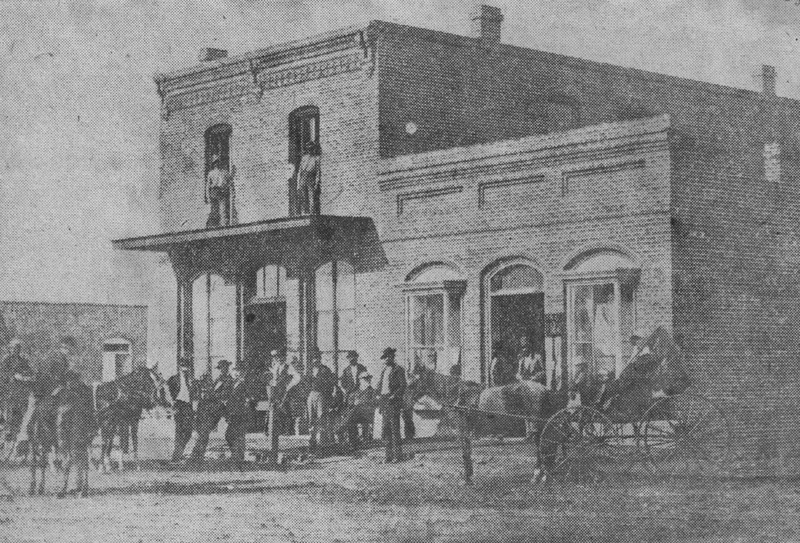 Burt & Bros. store). 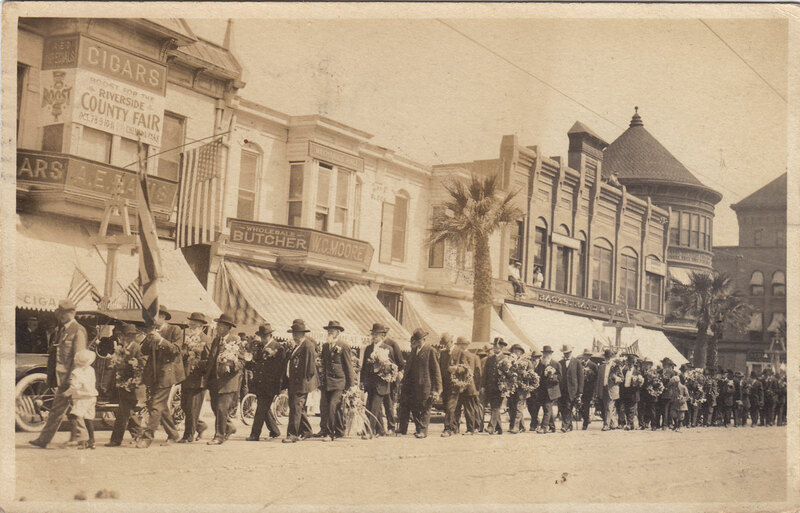 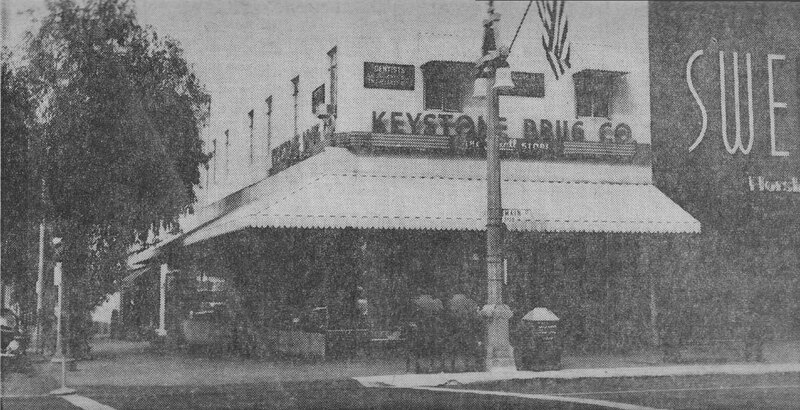 Among the retailers on the block at various times were H.F. Grout, Keystone Drug (in the B.D. 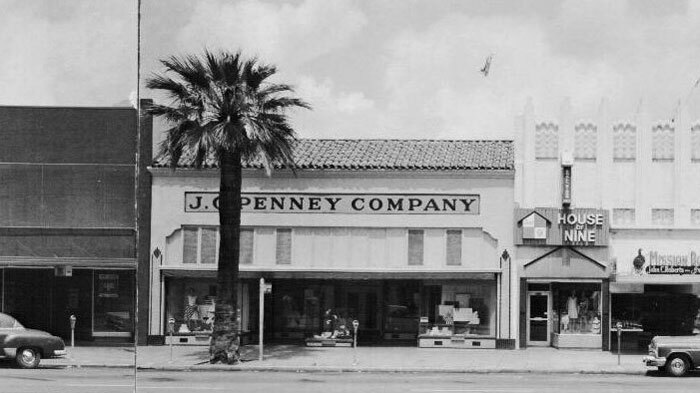 Burt Bros. building), and national retailer J.C. Penney (which relocated to a much larger building at the Tyler Mall in 1970). 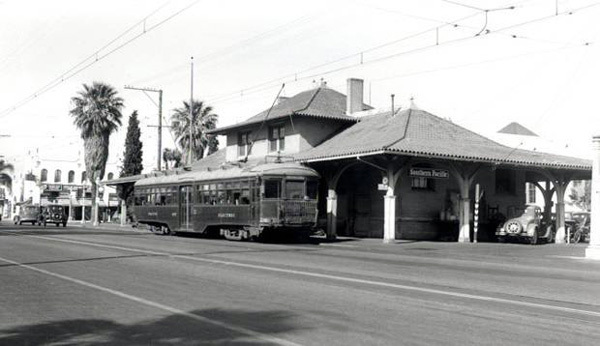 Also on the block along Market Street at various times was a Southern Pacific/Pacific Electric rail station, and later a bus station, as well as an early McDonald’s. 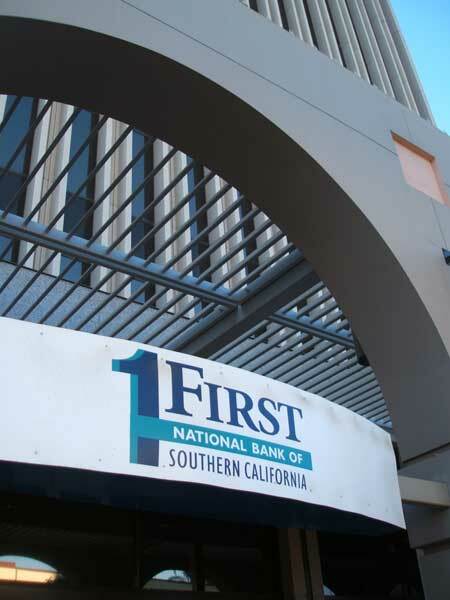 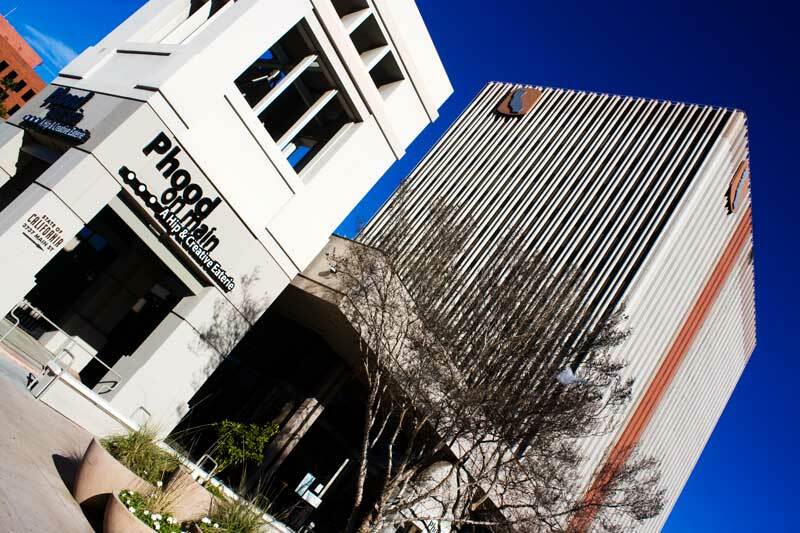 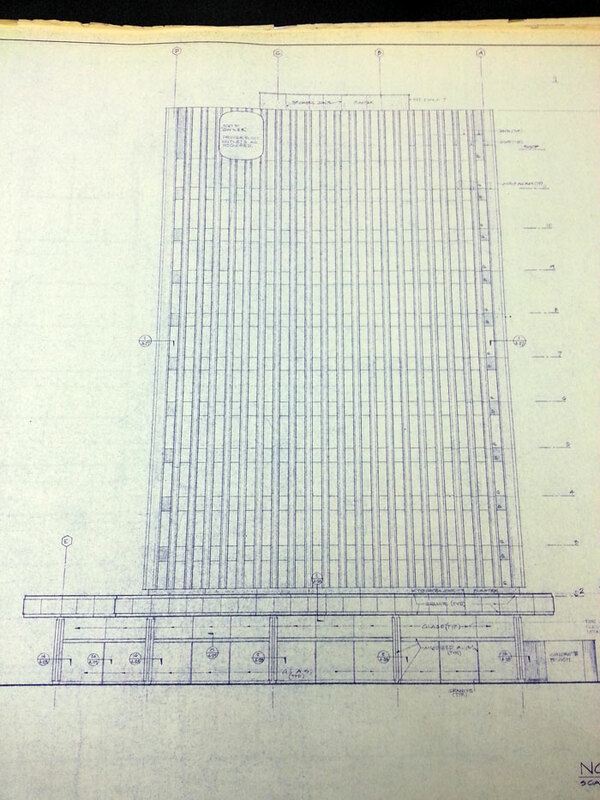 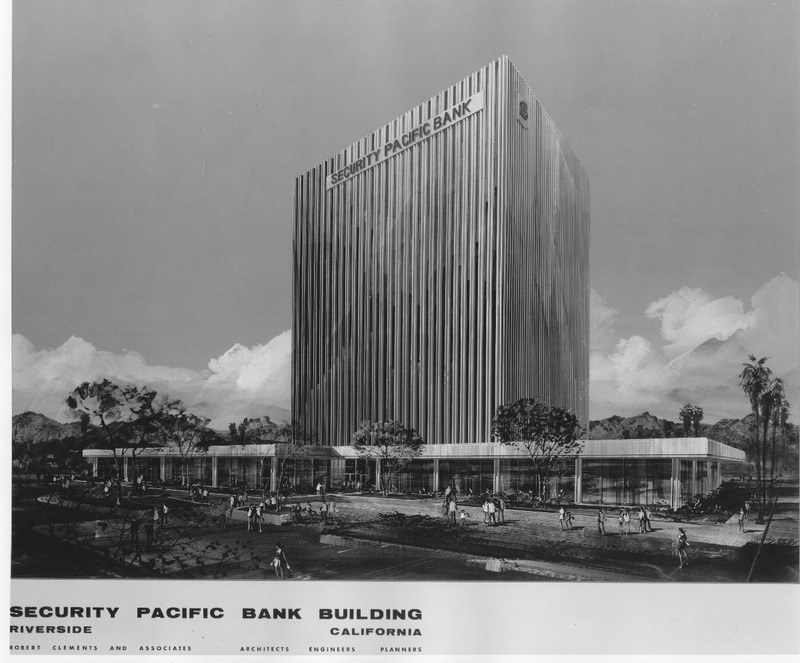 Built by Los Angeles-based Security Pacific National Bank (SPNB) for use as their Inland Division headquarters, the new development included an 11-story, 164-foot tower with flanking 1-story bank branch and commercial suites surrounding three sides of the building’s base. 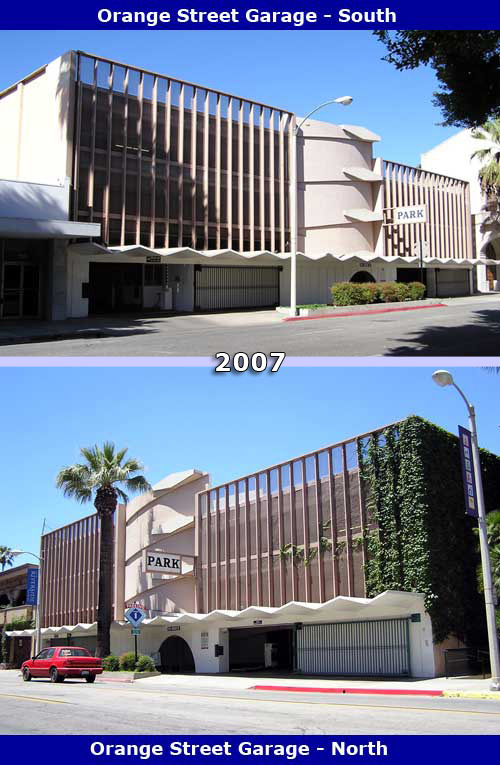 Two years later, the adjacent 3-story parking garage planned by the city and built by Riverside-based J.D. 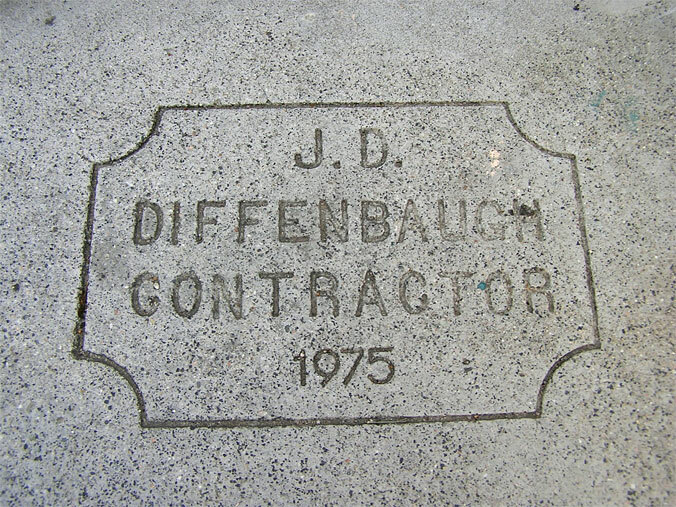 Diffenbaugh, opened as part of the overall project. 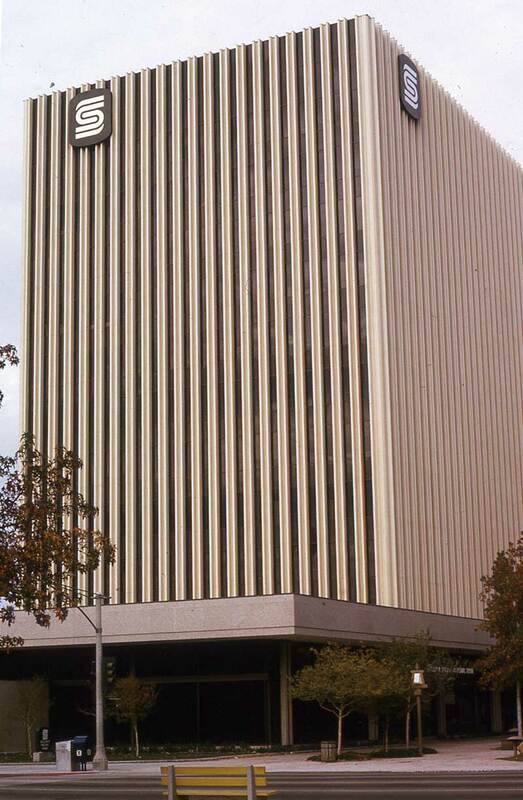 When completed, the development was one of the city’s largest and tallest commercial buildings (and surprisingly, still is 40 years later). 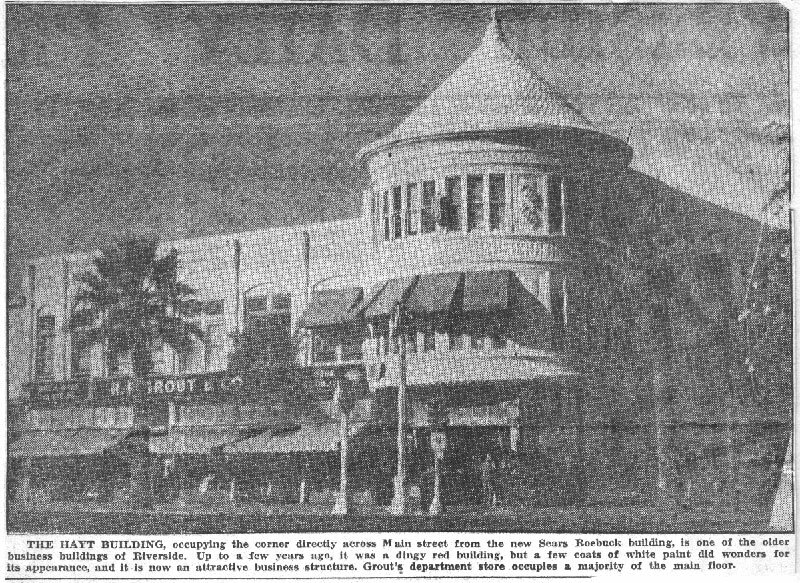 Originally proposed as a $4.5 million, 8-story building with flanking one-story, ground-floor wings, the designs quickly evolved into a larger, $6.1 million, 11-story, 150,000 square foot building of the same. 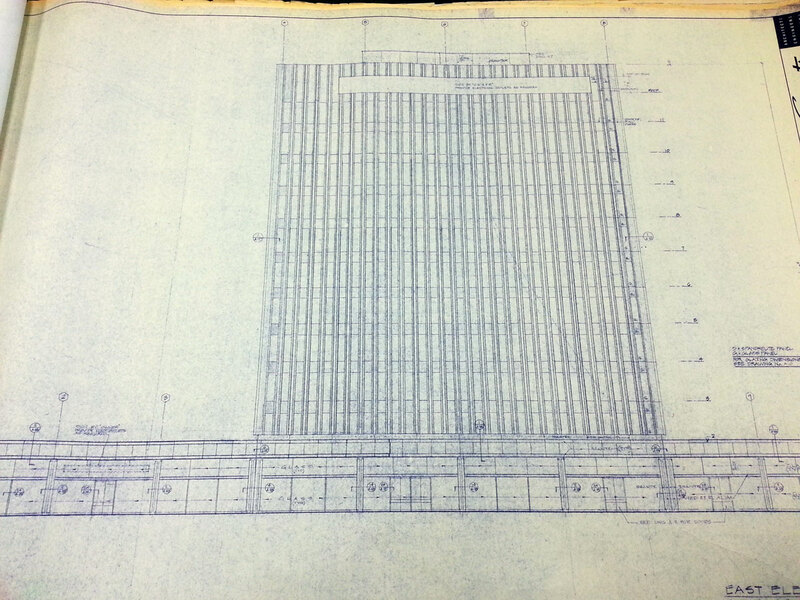 The larger 125,000 sq. 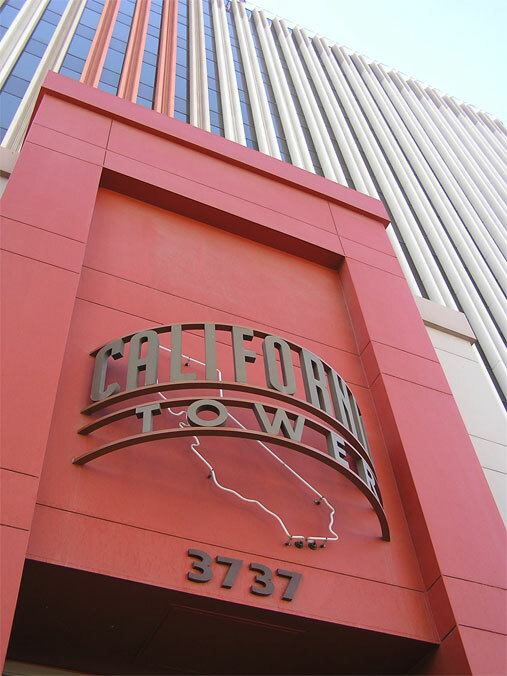 ft. tower (plus additional 25,000 sq. 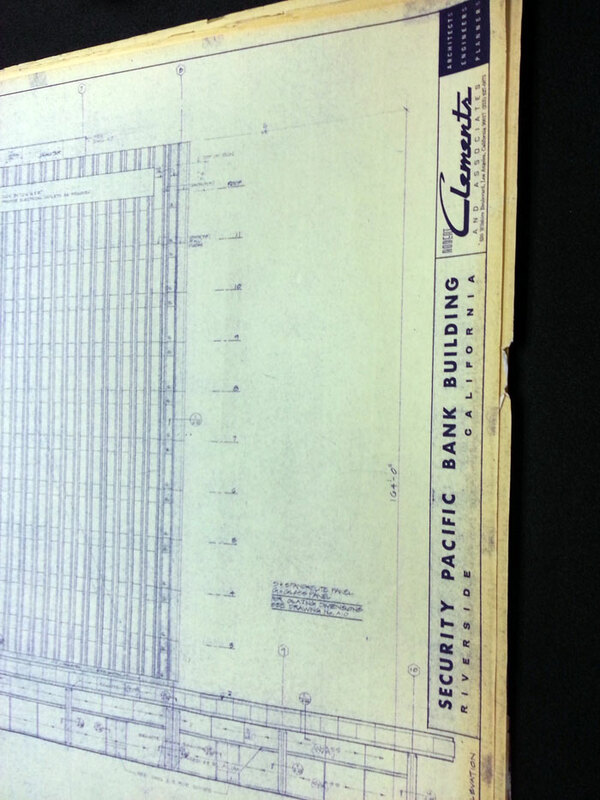 ft. ground level flanks) was expected to meet the bank’s 20-year growth projection. 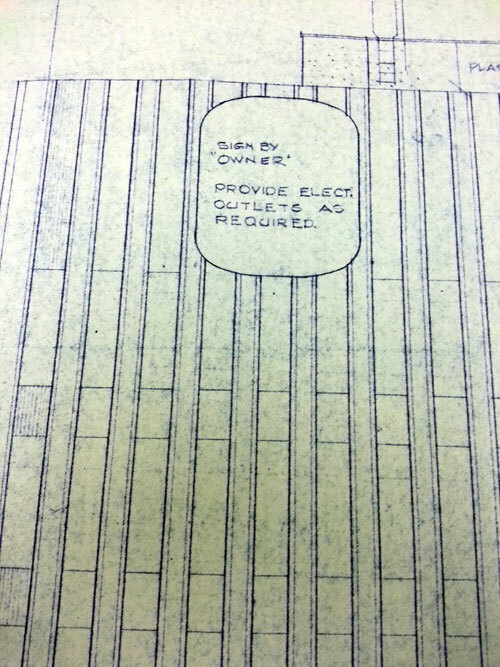 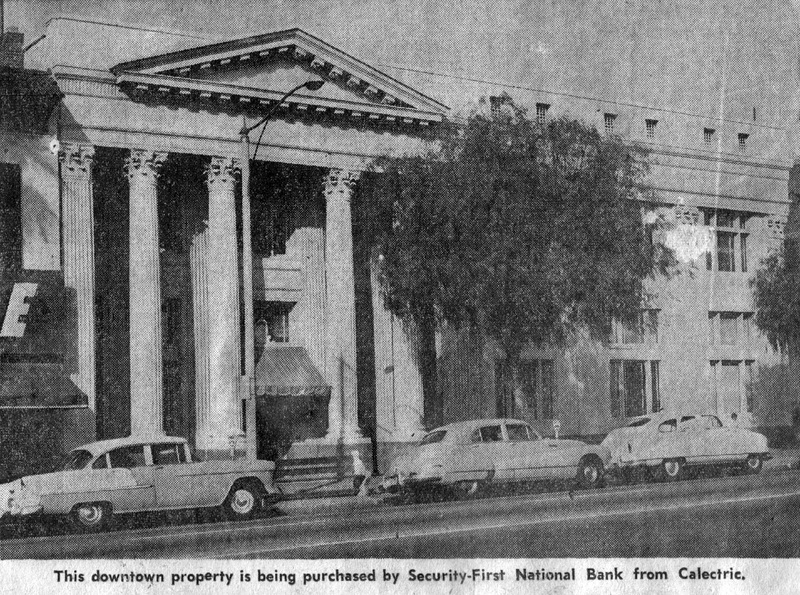 The project site was familiar to SPNB, which had a banking center on the block since 1959 when it purchased the old Southern Sierras Power/Calectric building at 3771 Eighth Street (now University). 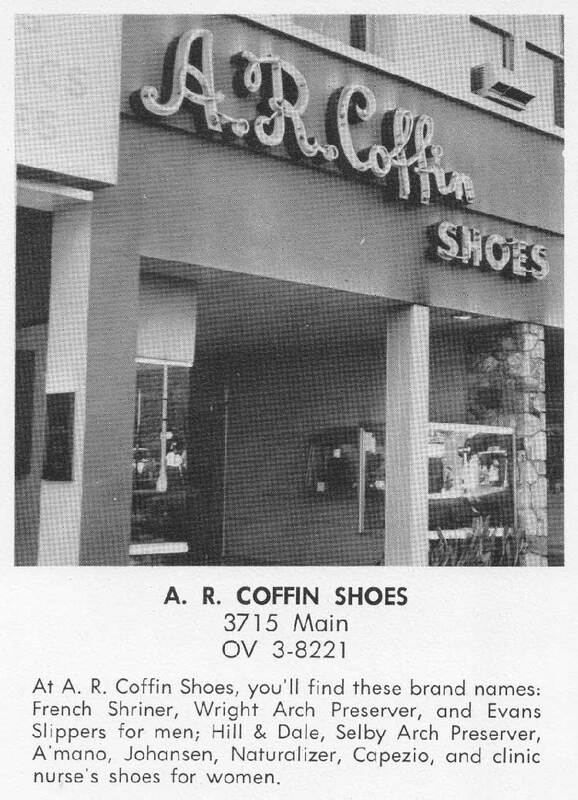 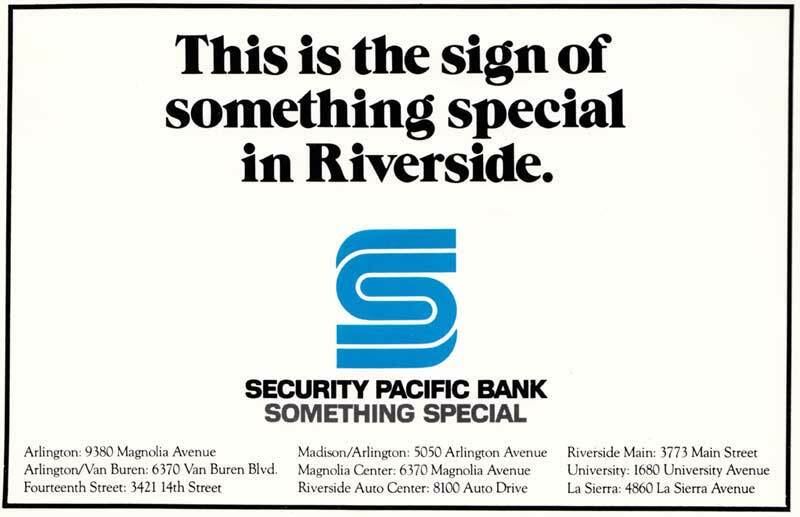 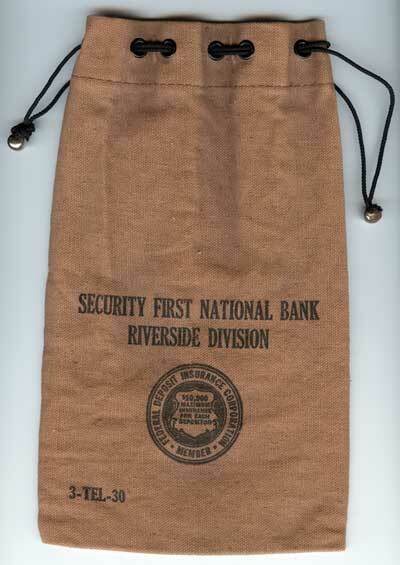 It also had a bank branch across the street at 3800 Main (in the Riverside First National/Citizen’s Bank building). 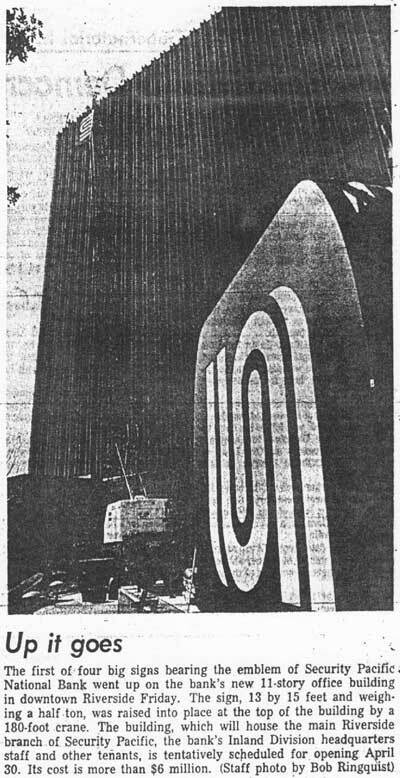 Construction on the tower began in April 1972 with signage installed nearly a year later in mid-March 1973. 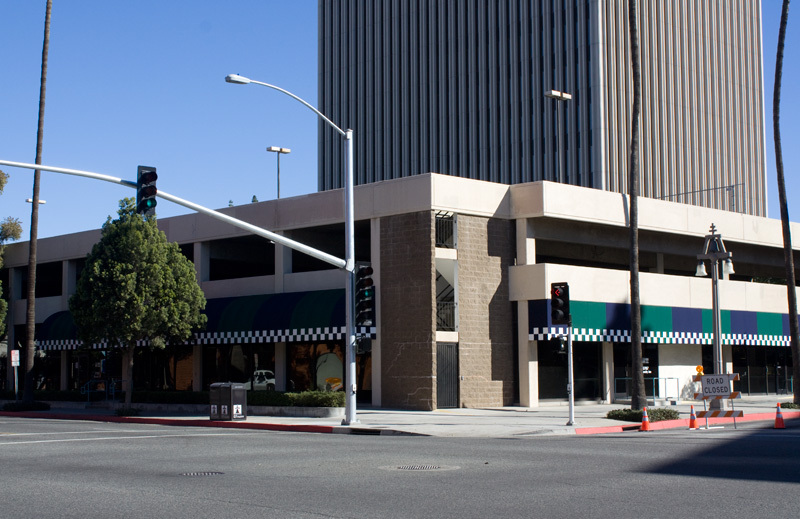 At ground level were the aforementioned 1-story flanks, with the southern portion along University Avenue housing a full-service Security Pacific Bank branch. 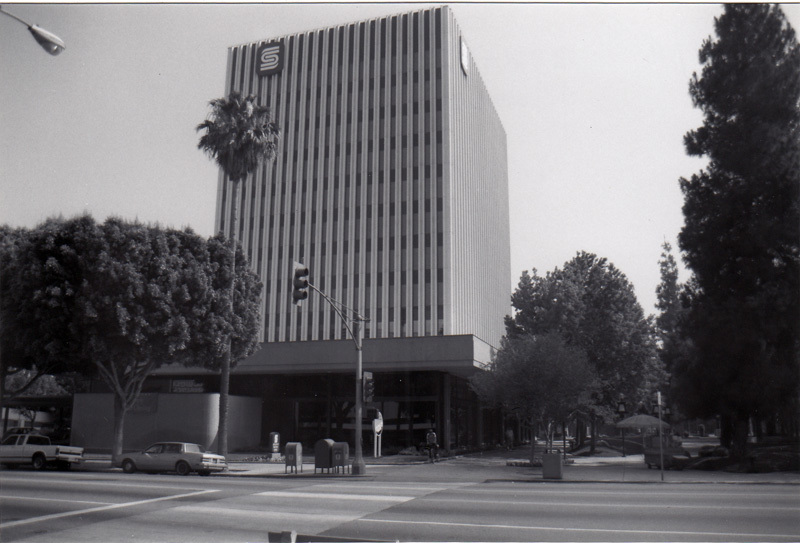 The bank, which replaced the existing branch across the street, officially opened on April 30, 1973. 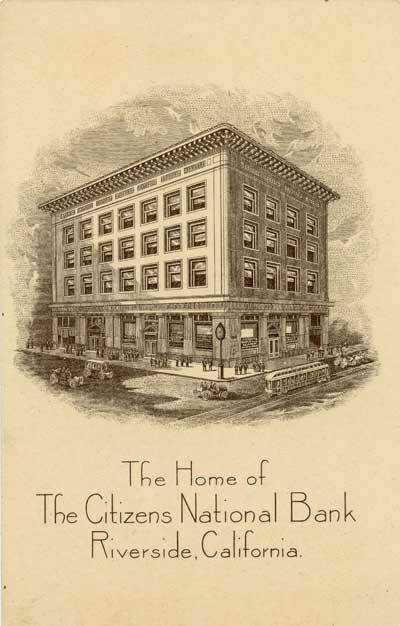 The new modern branch included drive-up teller lanes accessed via the alley behind the building (and are still somewhat apparent today, as is the original bank vault). 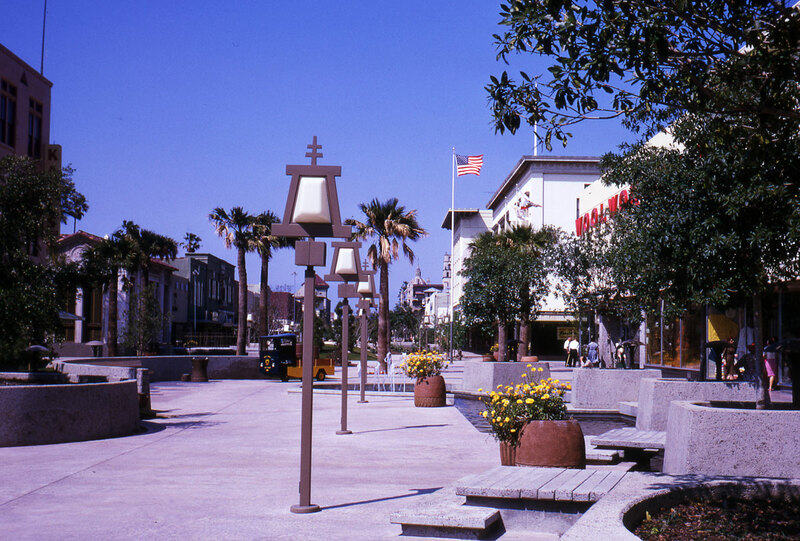 The remaining ground level space contained other commercial entities. 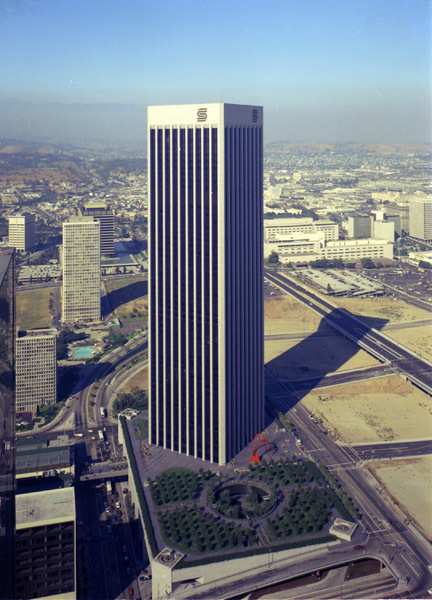 Designed by Robert O. Clements & Associates of Los Angeles, the 11-story exterior of the Riverside bank tower mimics that of the much larger, 55-story SPNB headquarters* building in downtown Los Angeles, which opened two years later in 1975. 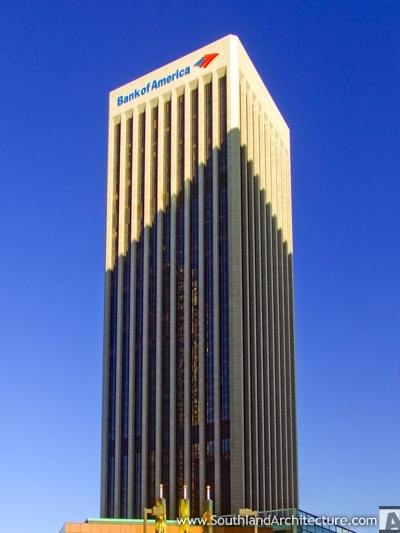 The LA building — now known as Bank of America Plaza* — was designed by LA-based A.C. Martin & Associates. 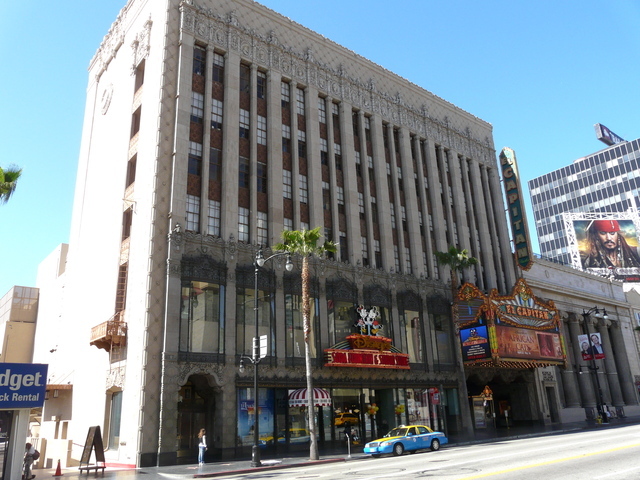 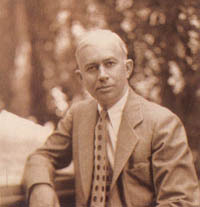 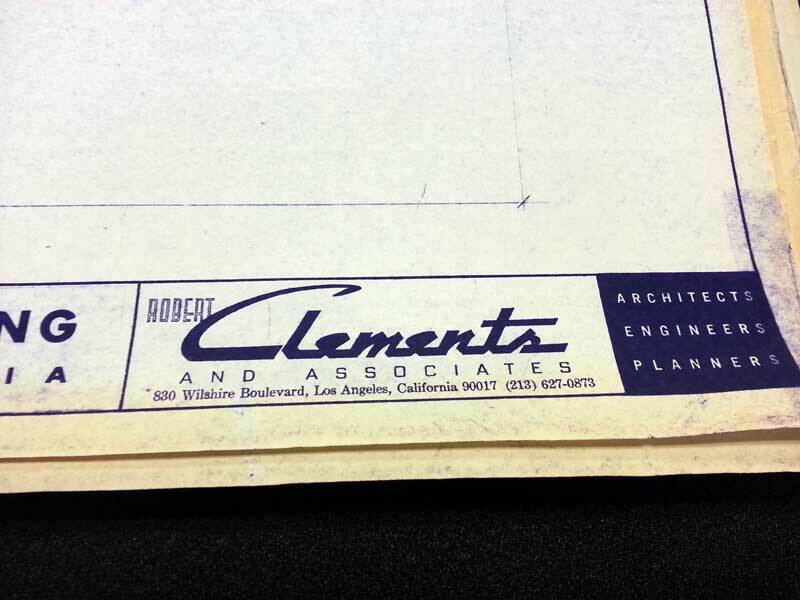 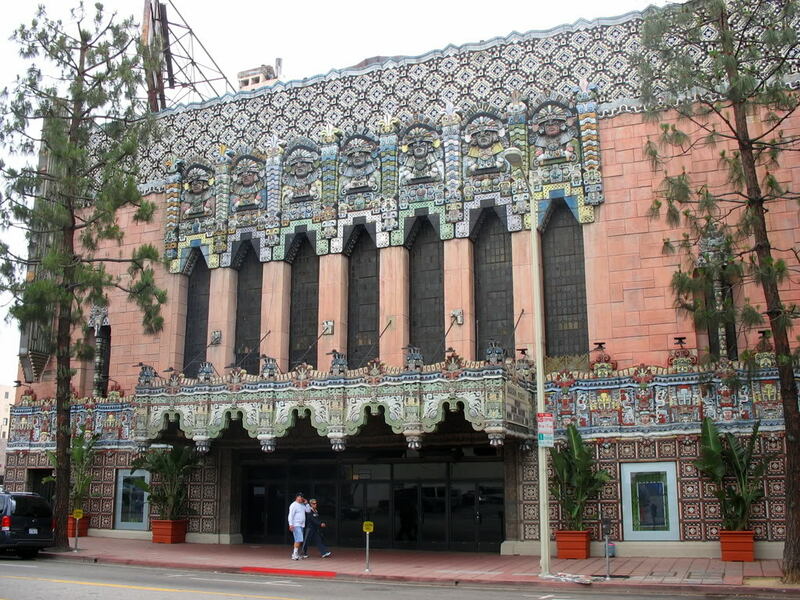 Robert O. Clements was the son of noted LA architect Stiles O. Clements (Wiltern, Mayan, and El Capitan theaters). 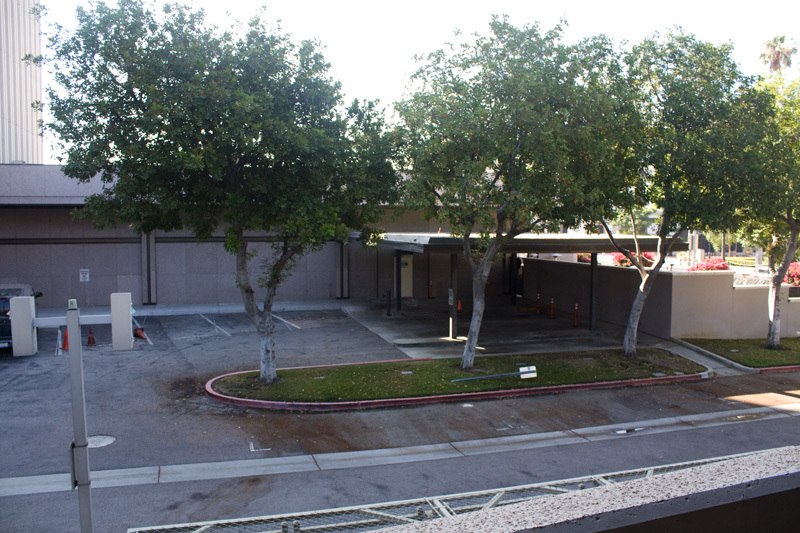 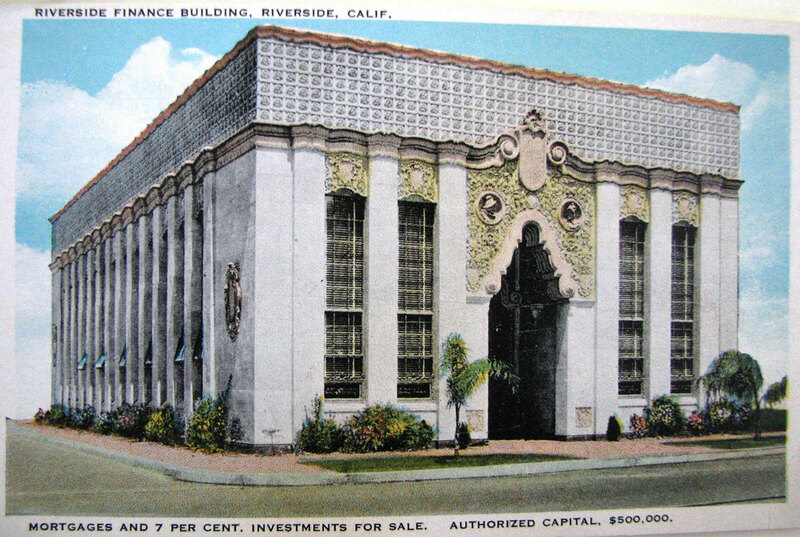 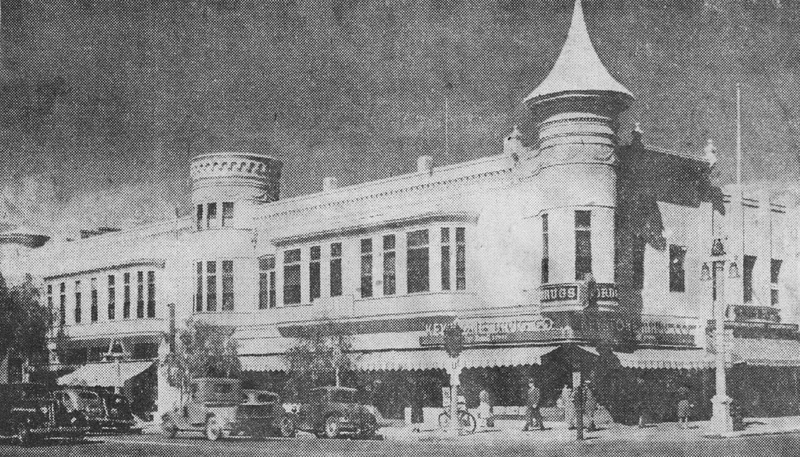 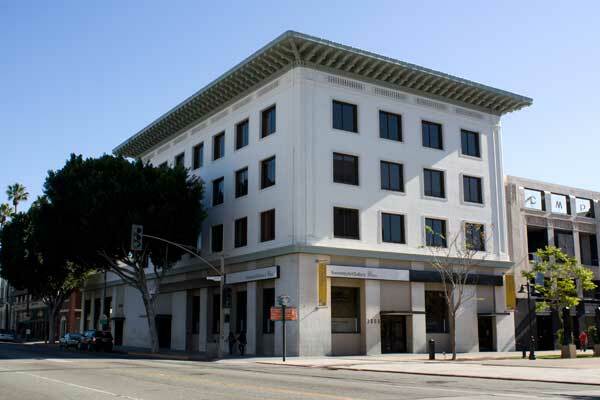 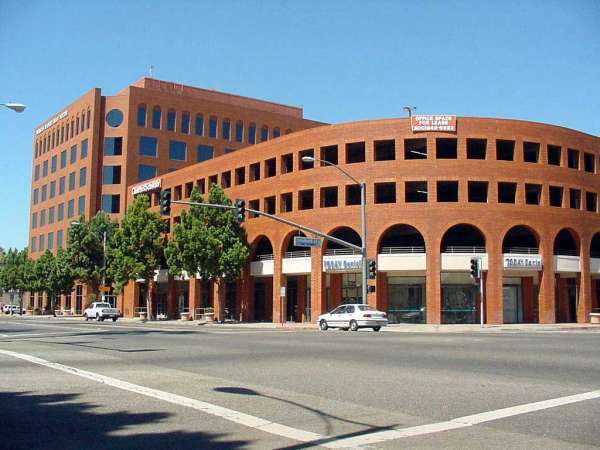 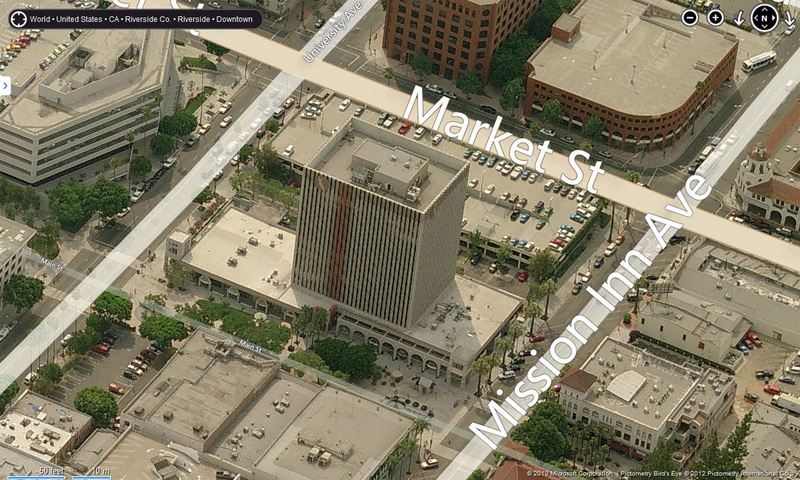 Stiles is known to have done one building in Riverside — the 1926 Riverside Finance Company/Citrus Belt Bank building. 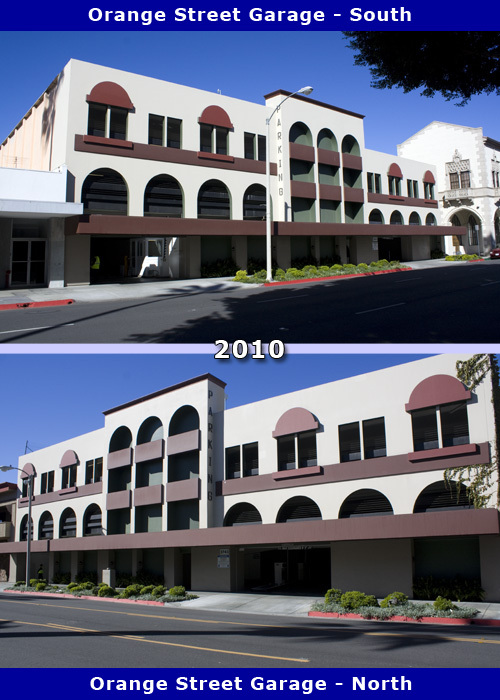 That building was recently refurbished by Riverside Community College and reopened in 2012 for use as the Center for Social Justice & Civil Liberties museum. 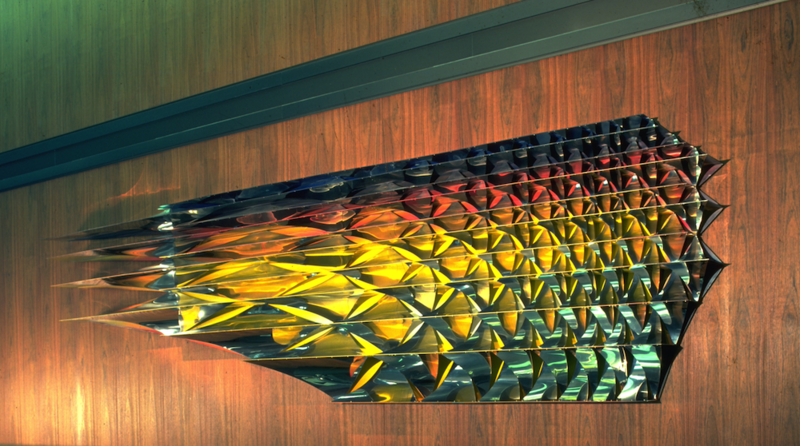 Inside the new downtown SPNB tower — presumably inside the bank branch itself — was an art sculpture by artist Charles O. Perry. 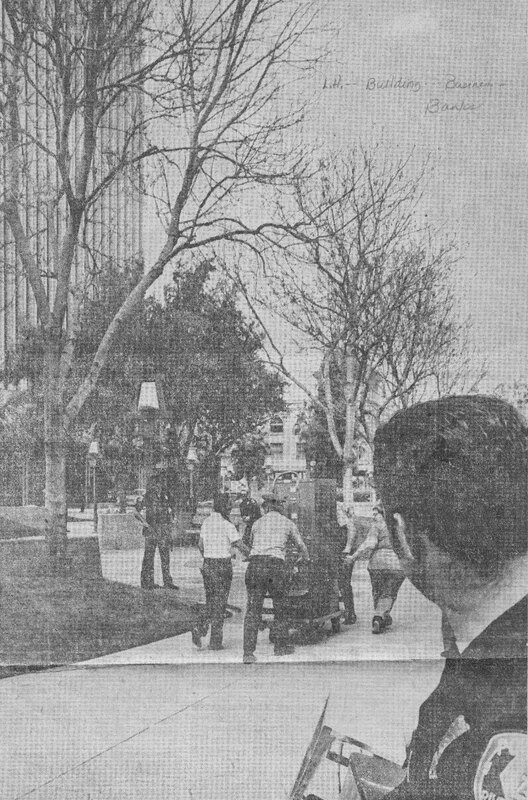 Entitled “Left Wing**,” the piece was one of many varying abstract art pieces by Perry scattered across the U.S. and elsewhere. 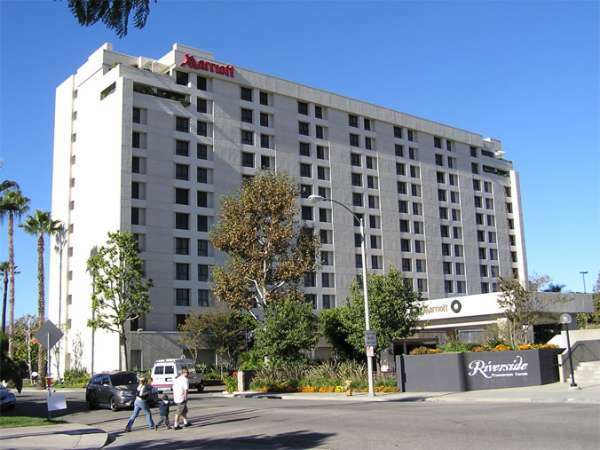 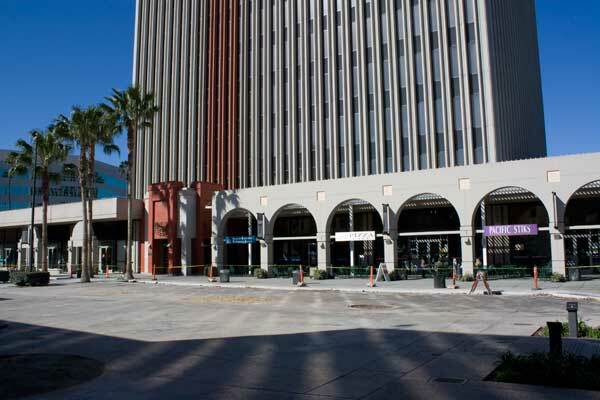 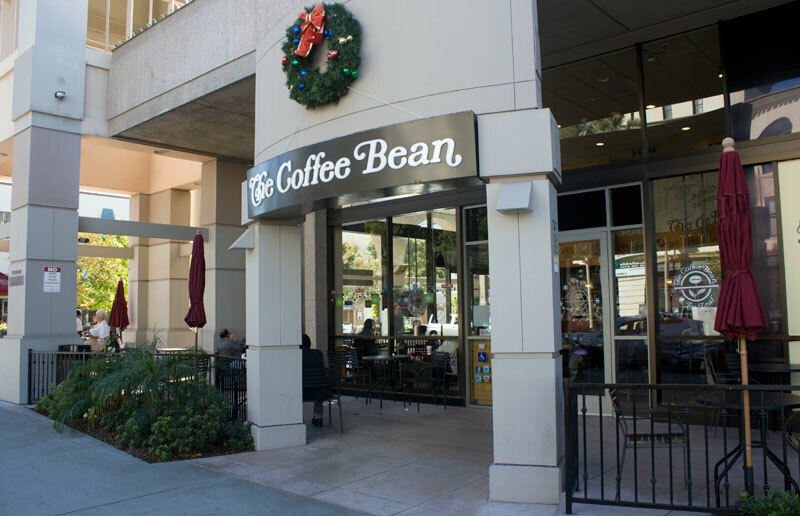 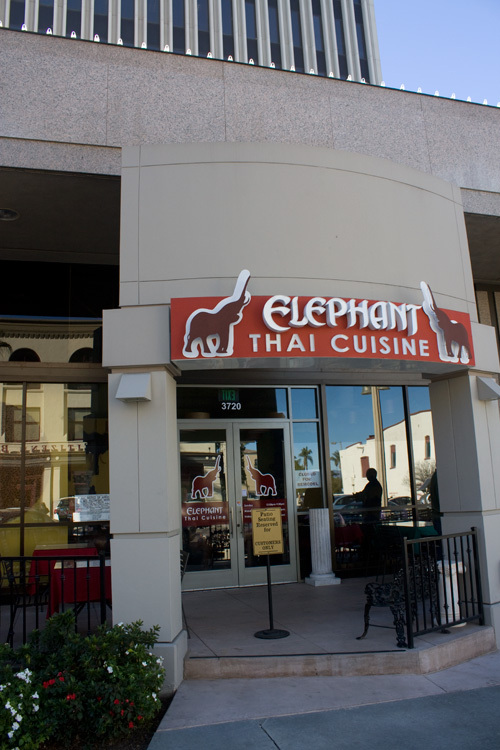 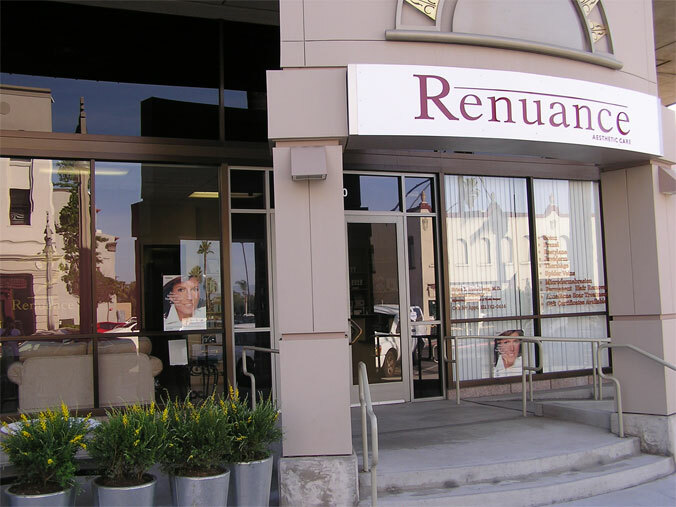 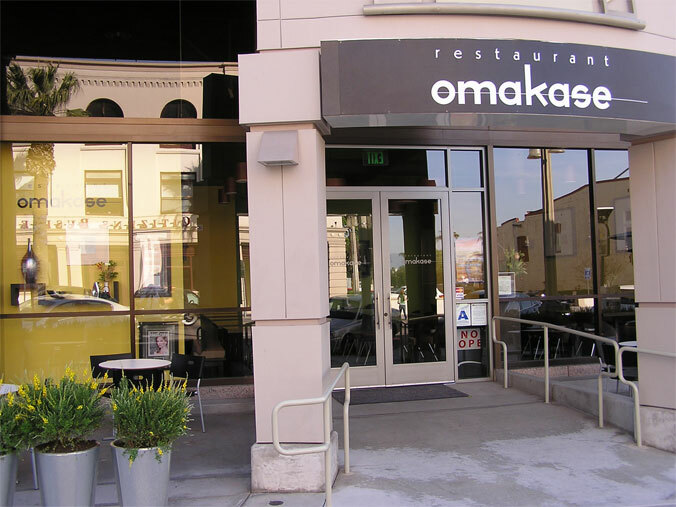 In California, a few of these locations included Fresno’s Fulton Mall, San Francisco’s Hyatt Regency Hotel, Orange County’s South Coast Plaza, and even the SPNB headquarters in downtown Los Angeles. 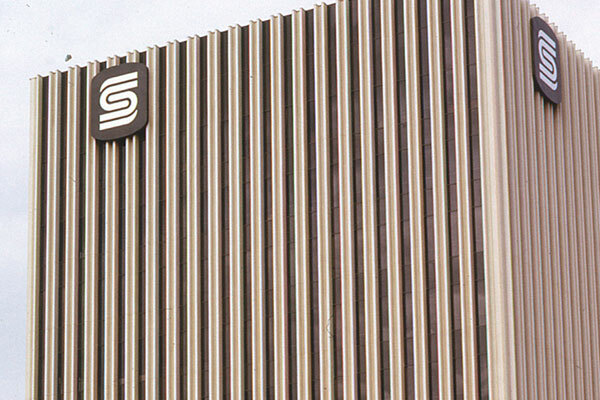 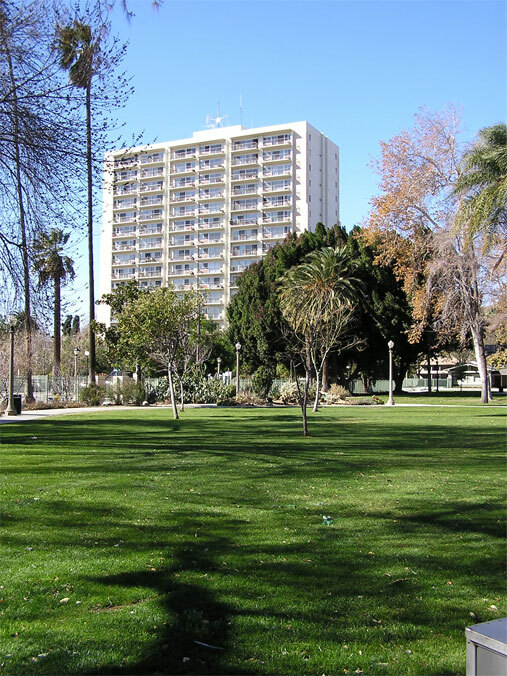 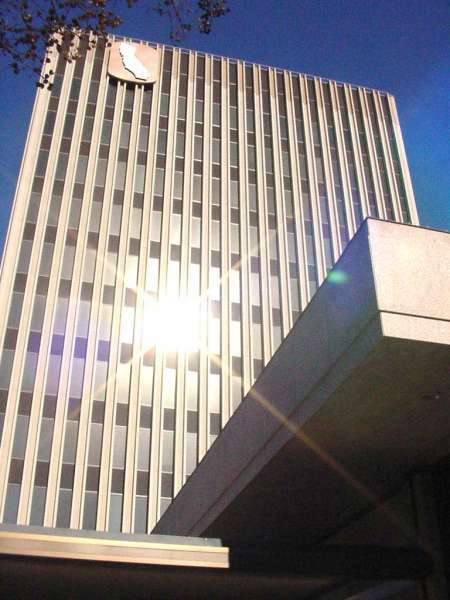 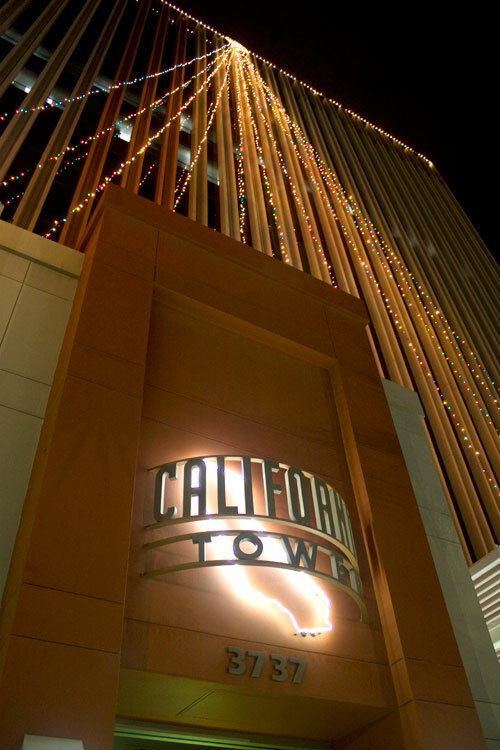 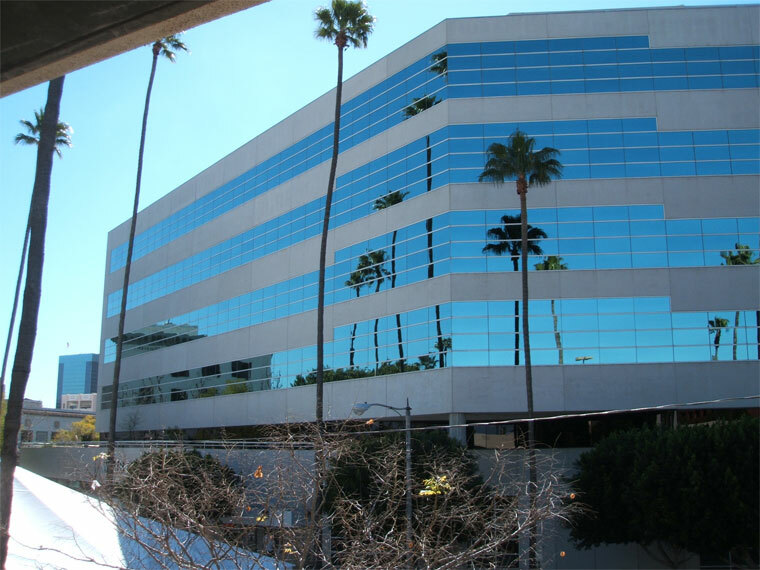 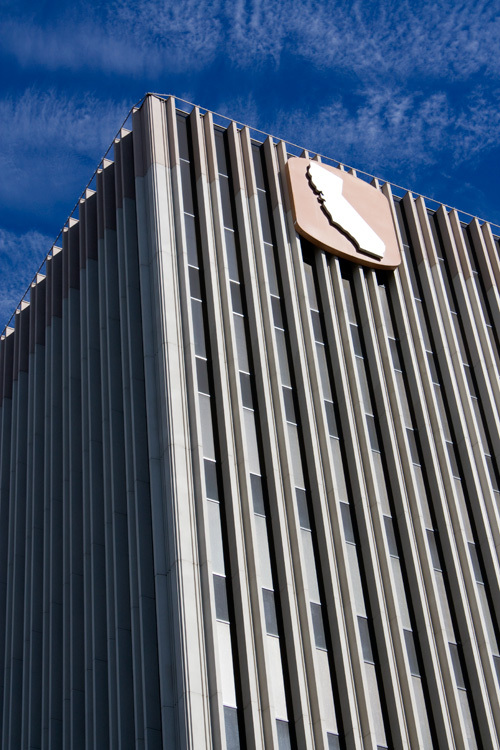 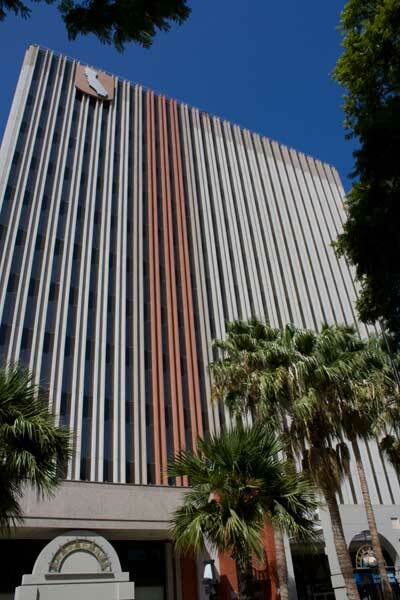 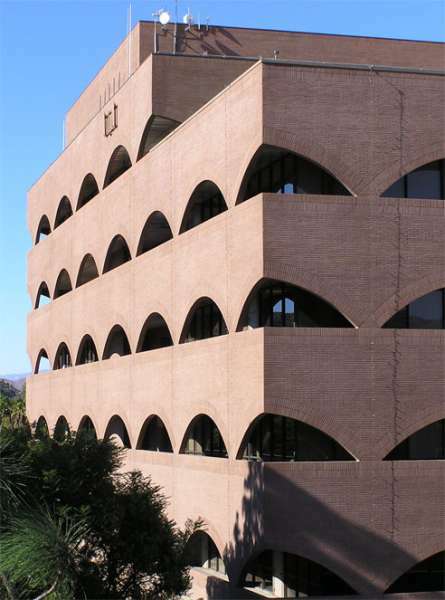 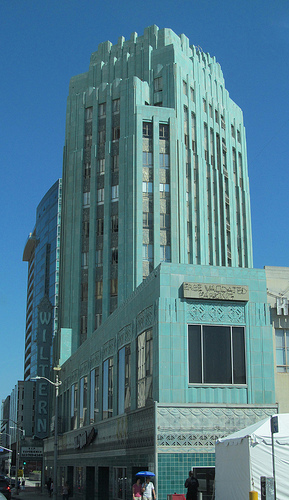 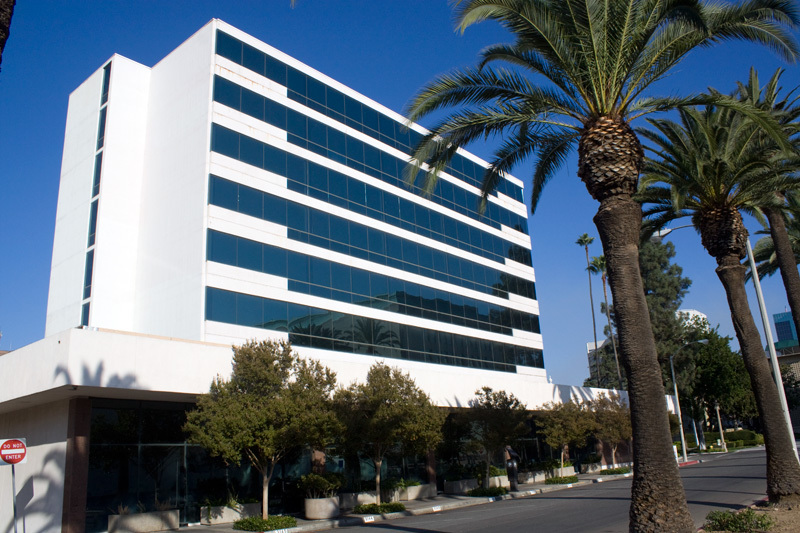 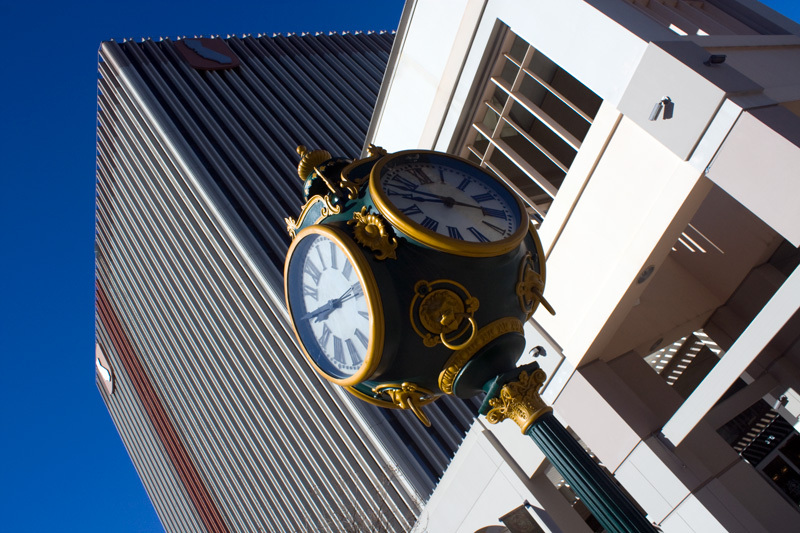 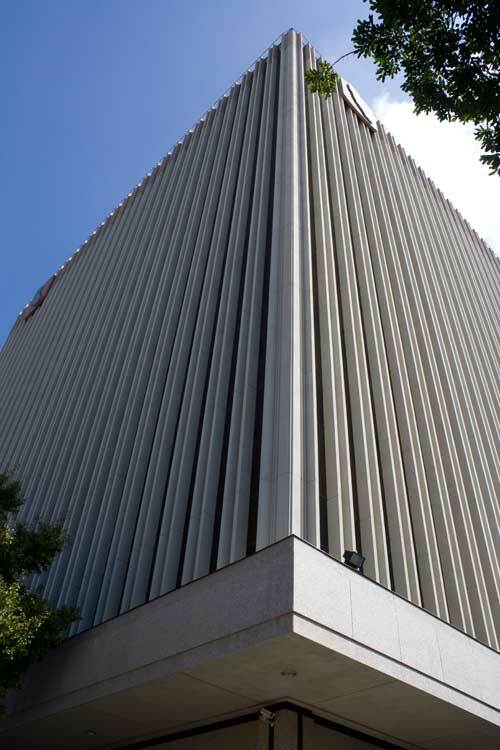 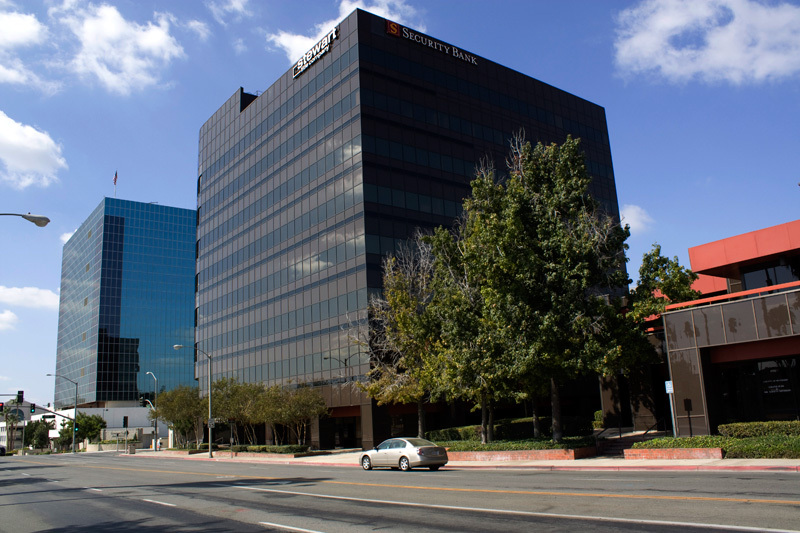 For nearly 20 years, the tower remained the Inland Southern California regional hub for Security Pacific National Bank. 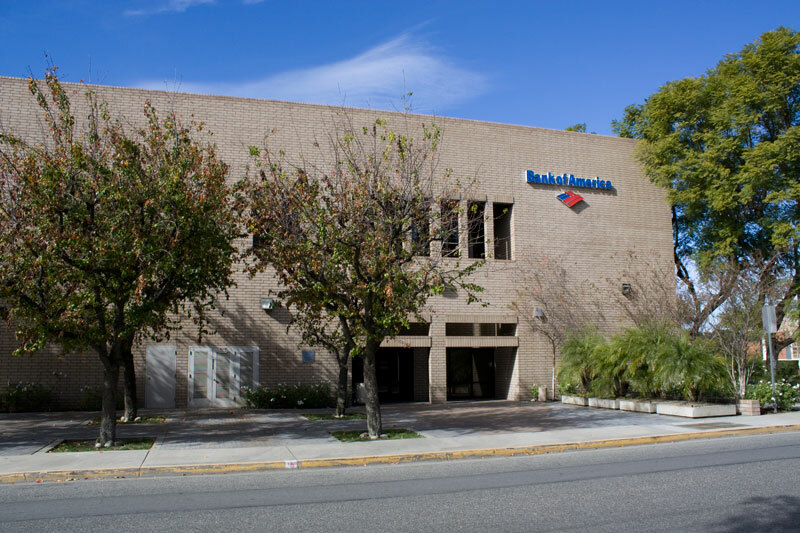 However, less than a year following the April 1992 merger of Security Pacific with Bank of America, the tower lost its primary tenant as Bank of America announced it was closing the SPNB tower branch in favor of its nearby, but much smaller, Fourteenth Street bank branch. 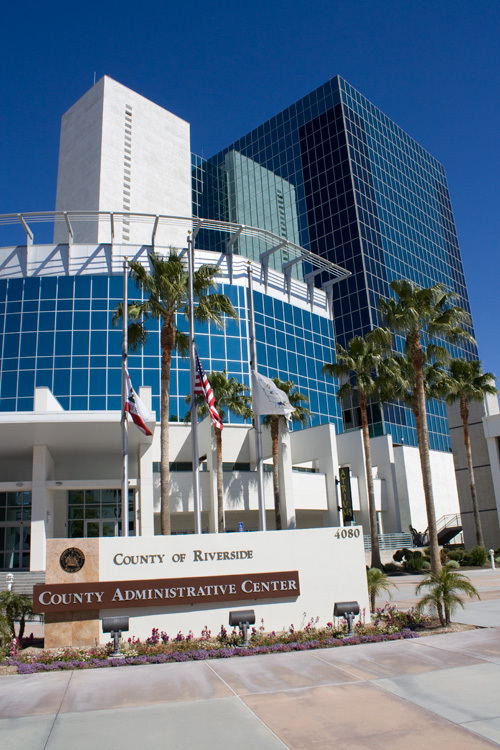 On a related note … as we inch closer to the year 2020 — the 150th year of Riverside’s 1870 founding — several of Riverside’s major modern commercial and civic buildings downtown will mark (or have marked) significant milestones. 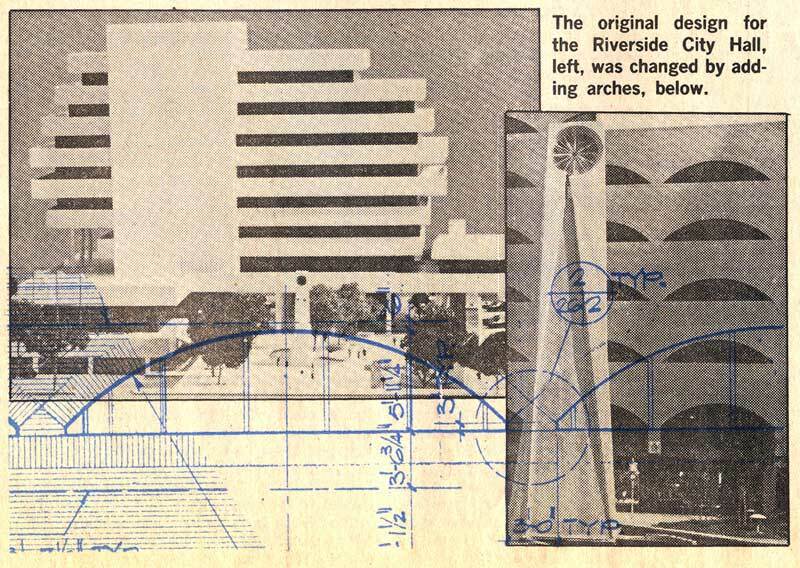 These include Crocker Bank (1965), Main Street Pedestrian Mall (1966), Mount Rubidoux Manor (@1971), Security Pacific Plaza/California Tower (1973), Riverside County Administrative Center (1975), Riverside City Hall (1975), Raincross Square Convention Center (1976), Riverside Centre (1982), Mission Square (1984), Riverside Sheraton/Marriott (1987), and Riverside Metro Center (1990).